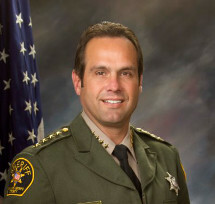 While San Luis Obispo County Sheriff Ian Parkinson has taken considerable heat following the release of video footage of Andrew Holland’s jailhouse death, Parkinson’s reelection campaign has simultaneously been drawing numerous large donations from supporters. Over the approximately two weeks since the release of the Holland video, Parkinson has received a total of 20 campaign contributions of at least $1,000. Those 20 contributions total $27,176 that have been added to Parkinson’s reelection war chest. Parkinson likely received additional contributions over that period. Only campaign contributions of $1,000 or more must be reported immediately. The largest contribution Parkinson has received since the release of the footage has been from Giuseppe’s Italian Restaurant, which contributed $3,384 to the sheriff’s campaign on March 21. The day prior, Walter Brothers Construction donated $3,000 to Parkinson. Parkinson also received two contributions of approximately $2,000. On March 21, Greengate Ranch and Vineyard contributed $2,060, and on Thursday, Borjon Auto Center gave Parkinson $1,982. On March 21 alone, Parkinson received seven contributions of $1,000 or more for a total of $10,694. Parkinson is running for reelection against retired police officer Greg Clayton, whom the Holland family is backing. Clayton, who is running on a campaign of justice and reform based on allegations of mistreatment of inmates under Parkinson’s watch, received a $25,000 contribution from the Holland family.